Brandon is now 6 and a huge fan himself, so he was super excited to go! It was a bit of a surreal experience given that I was around 6 myself when the movies first played in the theaters. It tapped into my own memories as well as the opportunity to relive through his young and innocent perspective. When you arrive, you are greeted by both large and small models of the many space crafts used in the film. The level of detail in how they are crafted and then painted is completely spectacular. They are displayed in large glass boxes and appear to be suspended in flight. Fortunately, you are able to get up pretty close which allows you to really enjoy the detail. 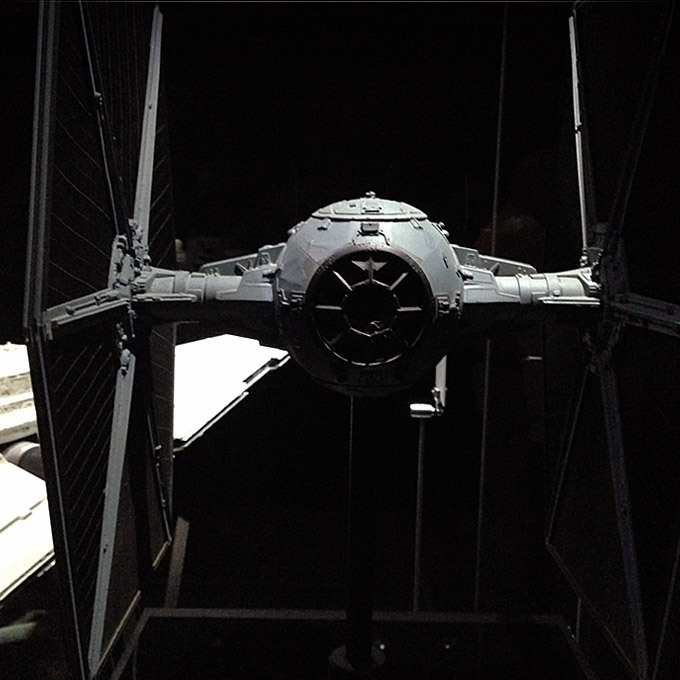 The X-Wing fighter and the Imperial Tie fighter are about the same size in scale. These units were likely used in same scenes. 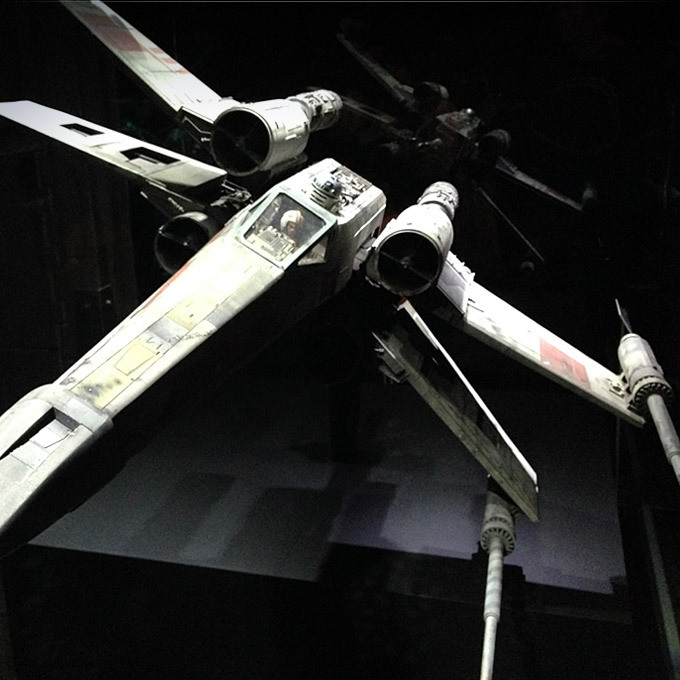 Sadly, in my excitement I did not remember to shoot any photos of the Millenium Falcon. As with each craft, there were multiple sizes to be used in different shoots to show perspective. As you continue, you then find a series of your favorite characters and their costumes intact. Bobba Fett is a favorite to both Brandon and myself. As you might imagine… We each fogged up the glass here for a bit. 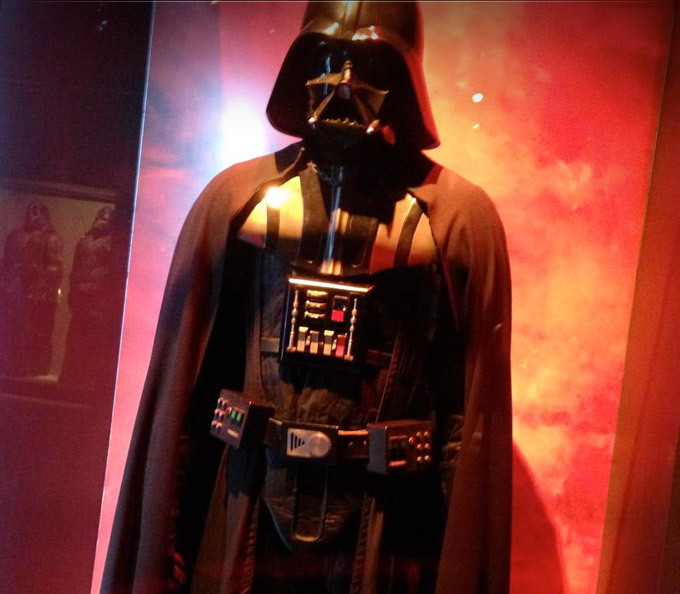 Close by you will find an equally impressive Darth Vader. He is lit up with an ambient dark reddish lighting that reflects off his black metallic sheen. He comes across dark and pretty darn creepy. Though truthfully I always thought he would be taller. Other cases show off the character components and their weaponry which are equally impressive. 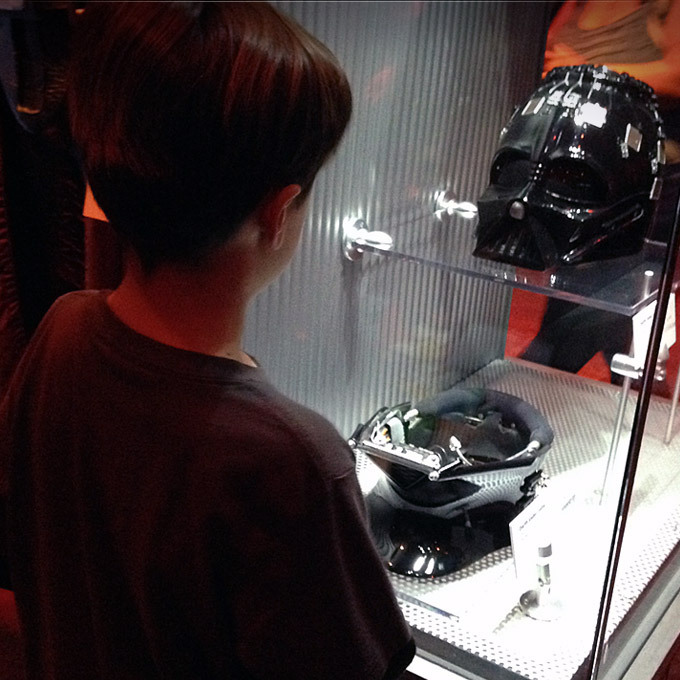 In this case, you can check out the separate pieces of Vader’s signature helmet as well as the detail crafted into the inner mask. 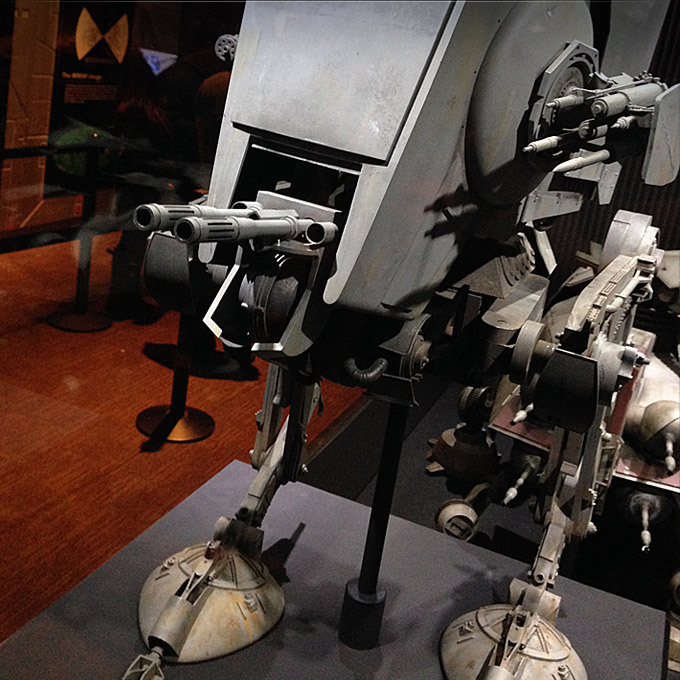 The AT-AT Walker (All Terrain Armored Transport ) was one of my personal favorites. The details ranging from the blasters to the hinged joints in the legs are fantastic. Bay Area locals are familiar with legend that George Lucas was inspired by the Cranes at the Port of Oakland when creating these Imperial transports! 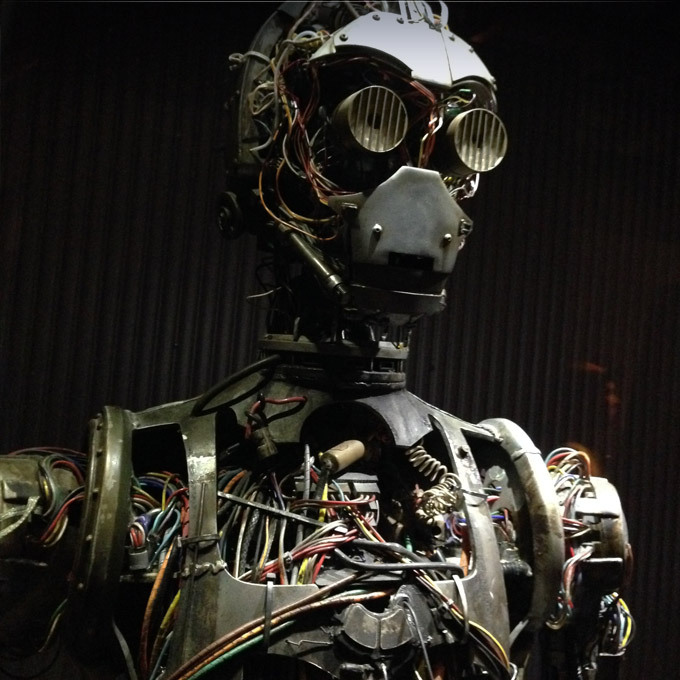 A “Naked C-3Po” – or unfinished as the story is told. Apparently, a young Anakin Skywalker built C-3PO entirely from scrap parts to help his mother with chores. However, since he did not finish him for years, poor C-3P0 was left uncovered for years. 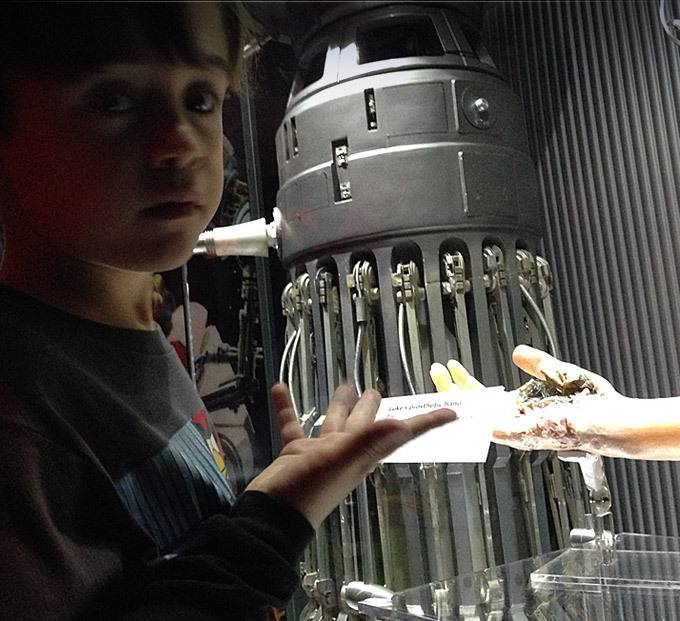 Brandon was super curious by Luke’s prosthetic hand from Empire Strikes back. 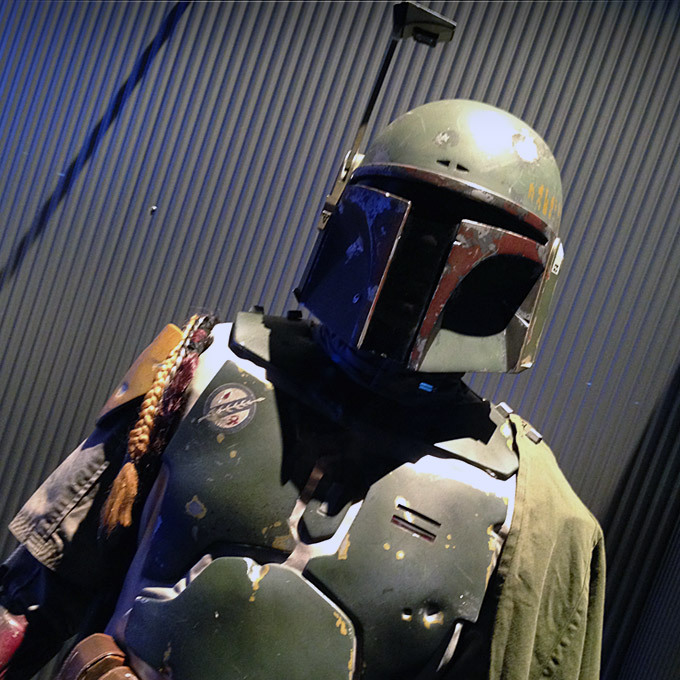 It was displayed beside a couple of medical droids along with some of their high tech instruments. He thought it was pretty creepy, yet still could not look away except to inspect his own hand by comparison. 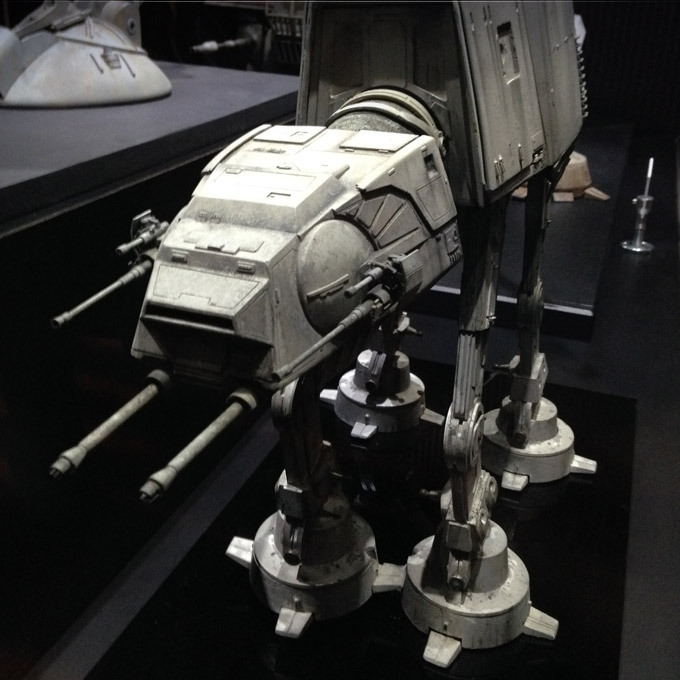 Close by the AT-AT walker was the smaller AT-ST, or All Terrain Scout Transport used by the Imperial troopers on the planet of Endor (Return of the Jedi). This was a larger unit with equally intense detail. The exhibit has been a huge hit and can be enjoyed by serious fans as well as folks who will simply appreciate the creativity & craftsmanship of all the models. It has been extended through late March, so there is still some time to enjoy. There are literally so many other things to see that I did not photograph. 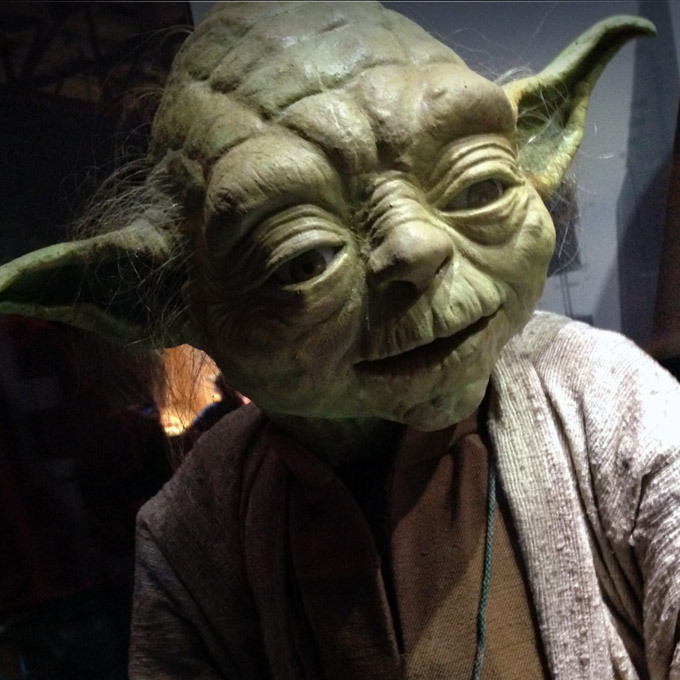 Space crafts, planet transports, costumes, robotics labs, magnetic levitation… you name it! 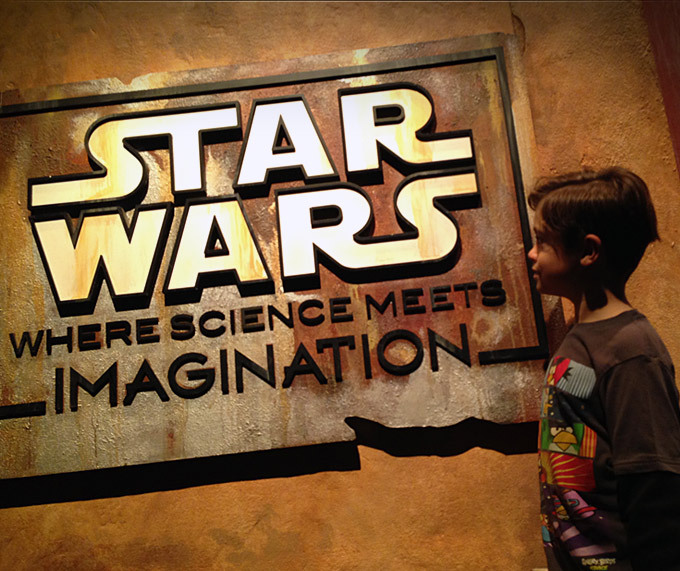 It is a worthy Saturday adventure for the kids or just the big kid inside all of us!